^ （英文）Wilson, D.E. & Reeder, D.M. (Ed.). (2005). Equus caballus caballus 互联网档案馆的存檔，存档日期2010-12-07..Mammal Species of the World: A Taxonomic and Geographic Reference (3rd ed), Johns Hopkins University Press, 2,142 pp. 月8日查阅. ^ Goody, John. Horse Anatomy 2nd. J A Allen. 2000. ISBN 0-85131-769-3. ^ Pavord, Tony; Pavord, Marcy. Complete Equine Veterinary Manual. David & Charles. 2007. ISBN 0-7153-1883-7. Anthony, David W. Bridling Horse Power: The Domestication of the Horse. Horses Through Time First. Boulder, CO: Roberts Rinehart Publishers. 1996. ISBN 1-57098-060-8. OCLC 36179575. Apperson, George Latimer and Martin Manser. Dictionary of Proverbs. Wordsworth Editions. 2006. ISBN 1-84022-311-1. Bartlett, Virginia K. Keeping House: Women's Lives in Western Pennsylvania, 1790–1850. University of Pittsburgh Press. 1994. ISBN 0-8229-5538-5. OCLC 30978921. Becker, Marty, Audrey Pavia, Gina Spadafori, Teresa Becker. 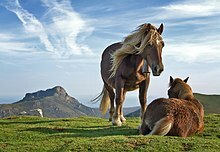 Why Do Horses Sleep Standing Up? : 101 of the Most Perplexing Questions Answered About Equine Enigmas, Medical Mysteries, and Befuddling Behaviors. HCI. 2007. ISBN 0-7573-0608-X. Belknap, Maria. Horsewords: The Equine Dictionary Second. North Pomfret, VT: Trafalgar Square Publishing. 2004. ISBN 1-57076-274-0. Bennett, Deb. Conquerors: The Roots of New World Horsemanship First. Solvang, CA: Amigo Publications, Inc. 1998. ISBN 0-9658533-0-6. OCLC 39709067. Bongianni, Maurizio. Simon & Schuster's Guide to Horses and Ponies. New York: Fireside. 1987. ISBN 0-671-66068-3. British Horse Society. The Manual of Horsemanship of the British Horse Society and the Pony Club 6th edition, reprinted 1970. Kenilworth, UK: British Horse Society. 1966. ISBN 0-9548863-1-3. Bryant, Jennifer Olson and George Williams. The USDF Guide to Dressage. Storey Publishing. 2006. ISBN 1-58017-529-5. Budiansky, Stephen. The Nature of Horses. New York:NY: Free Press. 1997. ISBN 0-684-82768-9. OCLC 35723713. Bush, Karen and Julian Marczak. The Principles of Teaching Riding: The Official Manual of the Association of British Riding Schools. David & Charles. 2005. ISBN 0-7153-1902-7. OCLC 224946044. Campbell, B.N. National Gambling Impact Study Commission Final Report (1999). Darby, PA: DIANE Publishing. 2001. ISBN 0-7567-0701-3. Chamberlin, J. Edward. 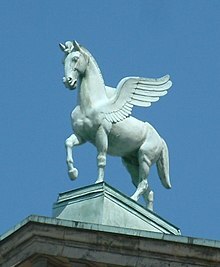 Horse: How the Horse Has Shaped Civilizations. New York, NY: Bluebridge. 2006. ISBN 0-9742405-9-1. OCLC 61704732. Collins, Tony, John Martin, Wray Vamplew. Encyclopedia of Traditional British Rural Sports. London, UK: Routledge. 2005. ISBN 0-415-35224-X. OCLC 57005595. DeFilippis, Chris. The Everything Horse Care Book. Avon, MA: Adams Media. 2006. ISBN 1-59337-530-1. OCLC 223814651. Dohner, Janet Vorwald. Equines: Natural History. (编) Dohner, Janet Vorwald. Historic and Endangered Livestock and Poultry Breeds. Topeka, KS: Yale University Press: 400–401. 2001. ISBN 978-0-300-08880-9. Edwards, Elwyn Hartley. Horses Second American. New York, NY: Dorling Kindersley. 2002. ISBN 0-7894-8982-1. OCLC 50798049. Edwards, Elwyn Hartley. The Encyclopedia of the Horse. London, UK: Dorling Kindersley. 1994. ISBN 1-56458-614-6. OCLC 29670649. Edwards, Gladys Brown. The Arabian: War Horse to Show Horse Revised Collectors. Rich Publishing. 1973. Ensminger, M. E. Horses and Horsemanship: Animal Agricultural Series Sixth. Danville, IN: Interstate Publishers. 1990. ISBN 0-8134-2883-1. OCLC 21977751. Ensminger, M.E. Horses and Tack Revised. Boston, MA: Houghton Mifflin Company. 1991. ISBN 0-395-54413-0. OCLC 21561287. Evans, James Warren. Horse Breeding and Management. Amsterdam: Elsevier Health Sciences. 1992. ISBN 0-444-88282-0. OCLC 243738023. Fear, Sally. New Forest Drift: A Photographic Portrait of Life in the National Park. Perspective Photo Press. 2006. ISBN 0-9553253-0-7. Fort, Matthew. Eating Up Italy: Voyages on a Vespa. London, UK: Centro Books. 2005. ISBN 0-00-721481-2. OCLC 60419304. Fox-Davies, Arthur Charles. A Complete Guide to Heraldry. Skyhorse Publishing Inc. 2007. ISBN 1-60239-001-0. Giffin, M.D., James M. and Tom Gore, D.V.M. Horse Owner’s Veterinary Handbook Second. New York: Howell Book House. 1998. ISBN 0-87605-606-0. OCLC 37245445. Hairston, Rachel and Madelyn Larsen. The Essentials of Horsekeeping. New York, NY: Sterling Publishing Company, Inc. 2004. ISBN 0-8069-8817-7. OCLC 53186526. Hammond, Gerald. The Language of Horse Racing. London: Taylor & Francis. 2000. ISBN 1-57958-276-1. OCLC 44923115. Harris, Susan E. Horse Gaits, Balance and Movement. New York: Howell Book House. 1993. ISBN 0-87605-955-8. OCLC 25873158. Harris, Susan E. The United States Pony Club Manual of Horsemanship: Basics for Beginners – D Level. New York, NY: Howell Book House. 1994. ISBN 0-87605-952-3. Hedge, Juliet and Don M. Wagoner. Horse Conformation: Structure, Soundness and Performance. Guilford, CT: Globe Pequot. 2004. ISBN 1-59228-487-6. OCLC 56012597. Howlett, Lorna and Philip Mathews. Ponies in Australia. Milson's Point, NSW: Philip Mathews Publishers. 1979. ISBN 0-908001-13-4. Hurd, Edward Payson (translator). Diseases of the Stomach and Intestines. New York, NY: W. Wood & Company. 1886. Kreling, Kai. The Horse's Teeth. Horses' Teeth and Their Problems: Prevention, Recognition, and Treatment. Guilford, CT: Globe Pequot. 2005. ISBN 1-59228-696-8. OCLC 59163221. MacGregor, Arthur. Bone, Antler, Ivory and Horn: Technology of Skeletal Materials Since the Roman Period. Totowa, NJ: Barnes & Noble. 1985. ISBN 0-389-20531-1. OCLC 11090630. Matossian, Mary Kilbourne. Shaping World History: Breakthroughs in Ecology, Technology, Science, and Politics. Armonk, NY: M.E. Sharpe. 1997. ISBN 0-585-02397-2. OCLC 156944228. McBane, Susan. A Natural Approach to Horse Management. London: Methuen. 1992. ISBN 0-413-62370-X. OCLC 26359746. McBane, Susan. The Illustrated Encyclopedia of Horse Breeds. Edison, NJ: Wellfleet Press. 1997. ISBN 0-7858-0604-0. OCLC 244110821. Mettler, John J. Jr. Horse Sense: A Complete Guide to Horse Selection and Care. Pownal, VT: Storey Communications, Inc. 1989. ISBN 0-88266-549-9. OCLC 19324181. Miller, Robert M. Understanding the Ancient Secrets of the Horse's Mind. Neenah, WI: Russell Meerdink Company Ltd. 1999. ISBN 0-929346-65-3. OCLC 42389612. Miller, Robert M. and Rick Lamb. Revolution in Horsemanship and What it Means to Mankind. Guilford, Connecticut: Lyons Press. 2005. ISBN 1-59228-387-X. OCLC 57005594. Mills, Bruce and Barbara Carne. A Basic Guide to Horse Care and Management. New York, NY: Howell Book House. 1988. ISBN 0-87605-871-3. OCLC 17507227. Myers, Jane. Horse Safe: A Complete Guide to Equine Safety. Collingwood, UK: CSIRO Publishing. 2005. ISBN 0-643-09245-5. OCLC 65466652. Olsen, Sandra L. Horse Hunters of the Ice Age. Horses Through Time First. Boulder, CO: Roberts Rinehart Publishers. 1996. ISBN 1-57098-060-8. OCLC 36179575. Olsen, Sandra L. In the Winner's Circle: The History of Equestrian Sports. Horses Through Time First. Boulder, CO: Roberts Rinehart Publishers. 1996. ISBN 1-57098-060-8. OCLC 36179575. Peissel, Michel. Tibet: the secret continent. Macmillan. 2002: 36. ISBN 0-312-30953-8. Price, Steven D.; Spector, David L..; Gail Rentsch; Burn, Barbara B. (editors). The Whole Horse Catalog: Revised and Updated Revised. New York: Fireside. 1998. ISBN 0-684-83995-4. Prince, Eleanor F. and Gaydell M. Collier. Basic Horsemanship: English and Western. New York, NY: Doubleday. 1974. ISBN 0-385-06587-6. OCLC 873660. Self, Margaret Cabell. Riding Simplified. Kessinger Publishing. 2005. ISBN 1-4191-0087-4. Sellnow, Les. Happy Trails: Your Complete Guide to Fun and Safe Trail Riding. Eclipse Press. 2004. ISBN 1-58150-114-5. OCLC 56493380. Smith, BP. Large Animal Internal Medicine Second. St. Louis, MO: Mosby. 1996. ISBN 0-8151-7724-0. OCLC 33439780. Sponenberg, D. Phillip. The Proliferation of Horse Breeds. Horses Through Time First. Boulder, CO: Roberts Rinehart Publishers. 1996. ISBN 1-57098-060-8. OCLC 36179575. Thomas, Heather Smith. Storey's Guide to Training Horses: Ground Work, Driving, Riding. North Adams, MA: Storey Publishing. 2003. ISBN 978-1-58017-467-1. Thorson, Juli S. Rugged Lark. (编) Martindale, Cathy and Kathy Swan (editors). Legends 7: Outstanding Quarter Horse Stallions and Mares. Colorado Springs, CO: Western Horseman. 2006. ISBN 0-911647-79-1. Tozer, Basil. The horse in history. London: Methuen. 1908. OCLC 2484673. Vogel, Colin B.V.M. The Complete Horse Care Manual. New York, NY: Dorling Kindersley Publishing, Inc. 1995. ISBN 0-7894-0170-3. OCLC 32168476. Wheeler, Eileen. Fence Planning. Horse Stable And Riding Arena Design. Armes, IA: Blackwell Publishing. 2006. ISBN 0-8138-2859-7. OCLC 224324847.